Welcome back to our blog series on preparing your vacation rental property for the busy season! As summer rolls around, the vacations and trips and travel plans start to pick up. This is a time when families, couples, friends, and solo travelers alike all love to explore and see someplace new. With so many people capitalizing on the warmer weather and extra vacation time, this is an equally excellent time for you to take advantage of traveling. With the non-recourse loan lenders from First Western Federal Savings Bank, you could get a loan to help you acquire a property to turn into a rental. This could be used for vacation or long-term tenant purposes, and serve as an added form of income. Investing in real estate is investing in a particularly lucrative market, and our non-recourse loan lenders are here to help. See some decorating tips to help make your property look phenomenal (as well as the importance of decorating), and contact our non-recourse lenders to learn about refinancing and more! As a vacation rental owner, the only way you’ll continue to generate profit is if guests keep coming. You want to create a place that not only appeals to your guests once, but preferably has them coming back. When your rental property stands out as an incredible place to stay, word of mouth (and online ratings) will travel — and likely bring more business with it. However, it should be noted that you need to have the budget to make the proper decorations happen. With First Western Federal Savings Bank, our non-recourse loan lenders can help you refinance your mortgage when the time is right. This means paying less, and having more funds that can be designated to making your vacation rental property better than ever. Themes, when decorating, do not have to be over the top, and they don’t even have to be obvious. But more than anything, you want your vacation rental property to be cohesive, and fit within the environment that it’s in. Our minds are trained to notice discrepancies, or things that don’t fit in, so if a cabin that’s nestled in the woods had a beach theme, it would feel off. You want your guests to be able to enjoy your vacation rental for a specific purpose, which is why having a unified feel to everything is so important. Theme can be as simple as color scheme, or it can be more detail-oriented. If your property is near the beach, a cute bungalow will have guests gushing over the theme. Stick with whites and blues and beiges to emulate the nearby surf, and decorate with artwork and shells that play off of the area. Have a vacation rental that’s a desert oasis? Play around with some sunset colors, beiges, as well as teals for a nice contrast when considering painting the walls. In more recent trends, succulents have grown in popularity, and having some lovely desert plant life in your vacation rental can add an excellent touch to the overall decor. No matter what your theme is, when done correctly, your vacation rental property will become more appreciated by your guests, as well as more memorable. This is crucial to having guests keep coming back (and to help your revenue continue to grow). As much as we love decorations, too many can feel cluttered. 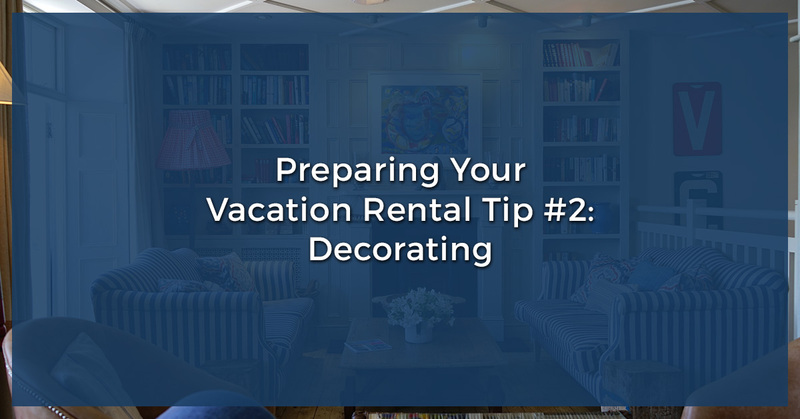 Besides, your guests are staying at your vacation rental for a short period of time — with too many decorations, it can feel less like they’re able to make this place a temporary home. By keeping your rental property looking balanced, but slightly vague, guests will be able to settle in a little more. Have wall space filled accordingly, but make sure there’s still plenty of wall to be seen. Opt for subtle decorations — such as a vase or stack of antique books — to serve as placeholders on shelves or coffee tables. Create a centerpiece that doesn’t overwhelm, but instead draws attention in a slight way. It can be easy to get whisked away in the land of catalogues and interior design magazines, and if you have the budget for it, by all means, do as you wish (and don’t forget how working with our non-recourse loan lenders for refinancing can help make that budget blossom a bit further). But one way to support local shops, your vacation rental property’s overall aesthetic, and your decorating budget is by checking out nearby antique or thrift stores. You can often find some gems for decorating at these types of stores, and the authenticity will not be easily missed by your guests. That mountainous cabin of yours would look great with some antique fishing poles mounted on the wall, or a framed shadowbox of different types of dried flowers or leaves in the area. The near-the-city rental property might look much improved with some novelty reminders placed accordingly (like books, city decorations, or even old maps and street signs) to show what life looked like back then. The point with decorating is that a cohesive rental property does not need to cost an arm and a leg to look fabulous. Subtle touches, when done correctly, speak volumes. We’ll be back at First Western Federal Savings Bank with a few more tips on preparing your vacation rental property for the summer. Regardless of if your property is brand new or has been existing for awhile, it’s never a bad idea to think about updating and upgrading the look and feel of your place. At the very least, your guests will be sure to love the effort and thoughtfulness you put into creating a vacation rental for them to enjoy. Interested in starting up a vacation rental property? Our non-recourse loan lenders can help. Learn about some of the necessary aspects you need to meet in order to qualify for a non-recourse loan, and get started with our lenders today! We look forward to working with you.